Looking for a cheeky getaway? Be sure to check out the great deals at Groupon like this City Break to Venice including Choice of Hotels and return flights for as little as £69 each! Located in the district of Mestre in Venice, the four star Smart Hotel Holiday and Apogia Sirio Venezia feature modern interiors and on-site restaurants serving local cuisine specialities. Guests can unwind in air-conditioned rooms which come complete with flat-screen TVs and en suite bathrooms. Hotel President awaits travellers close to the famous Piazza Ferretto in Mestre. The en suite rooms boast classic decor, TVs, and minibars, while the hotel’s bar offers a selection of drinks. 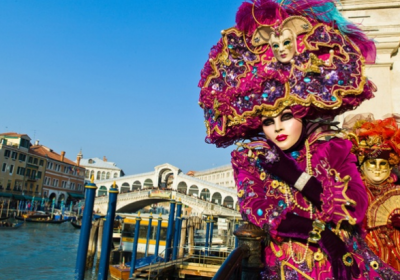 Travellers can celebrate Venice Carnival during a famous Grand Gala evening full of sets, eighteenth-century costumes, lights and colours. Guests will have a chance to see some traditional Venetian dances and the unique Magic Grand Show involving musicians, dancers, singers and acrobats.